Alexander McQueen was launched in 1992. From the Spring of 1994 McQueen has managed to produce a collection every season, even though he had no money. 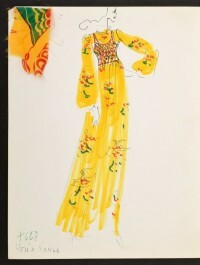 His mother Joyce recalls that he borrowed money from her to buy materials for making up his designs. In 1996 he was picked by the manufacturer Onward Kashyiama, which has backed his business financially ever since and licensed his name in Japan. 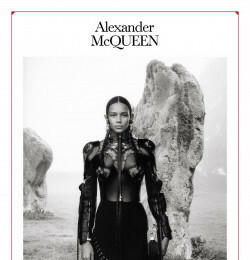 McQueen has invested the money in a house in Islington, London. At the end of 1999, Alexander McQueen opened his first store in London, at Conduit Street. In December 2000 a new partnership saw the Gucci Group acquiring 51% of the company. Recent developments include the opening of flagship stores in New York, London and Milan and the launch of the first McQueen Fragrance 'Kingdom', the addition of the new Menswear and Eyewear collections. 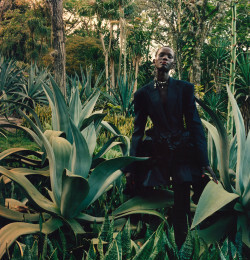 In its partnership with Alexander McQueen, the Gucci Group will provide the managerial talent and infrastructure necessary to develop the brand and extend it firmly into accessories and perfume as well as ready-to-wear. Alexander McQueen opened important directly operated stores in New York, London and Milan. In January 2004 he launched the first ready to wear menswear collection. January 2006 sees the birth of ï¿½McQ ï¿½ Alexander McQueenï¿½, a denim-based ready-to-wear line under a new label. The collections which include womenswear, menswear and accessories are manufactured and distributed worldwide by SINV Spa. Suddenly passed away in February 2010, the founder Lee Alexander McQueen was one of the greatest fashion designers of his generation, with his sometimes provocative genius. His catwalk shows were real taught-provoking, energetic and moving performances. With the appointment of Sarah Burton as Lee McQueenï¿½s successor in May 2010, the brand will carry on the tradition of his visionary and avant-garde designs. Alexander McQueen's collections are known for both the emotional power and raw energy of his shows as well as the romantic but determinedly contemporary nature of this clothes. It is typical of McQueen to use the juxtaposition between contrasting elements; fragility and strength, tradition and modernity and fluidity and severity. An openly emotional and even passionate viewpoint is realised with a profound respect and influence for the arts and crafts tradition. 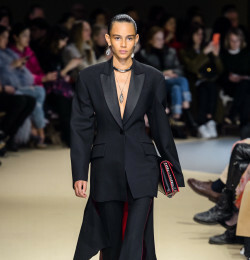 Alexander McQueen's collections combine an in-depth working knowledge of bespoke British tailoring, the fine workmanship of the French Haute Couture atelier and the impeccable finish of Italian manufacturing. Alexander McQueen's collections for Givenchy have included golden eagles embroidered by Lesage, rose petals pressed into sheer organdie, pure gold material woven for a bolero jacket, feathers painstakingly layered like a bird's wing onto a catsuit and other unique weird styles. But he has not forgotten that he must play the Givenchy game, if he is to succeed. He has managed to continue to design in his funky, youthful modern manner at his own house of McQueen while also producting the elegant, expensive, beautiful creations at Givenchy. This takes a real effort, but so far he is succeeding. He will probably get better as he gains more experience even though these two houses are so different.